A PA government headed by Rami Hamdallah will be sworn in before Chairman Mahmoud Abbas on Thursday evening in Ramallah. The 16th Palestinian Authority government headed by Rami Hamdallah will be sworn in before PA Chairman Mahmoud Abbas on Thursday evening in Ramallah, the Bethlehem-based Ma’an news agency reported. The government's formation will remain unchanged, the report said. Fatah lawmaker Azzam al-Ahmad told Ma’an that a meeting was held between Abbas and Hamdallah on Wednesday, in which Abbas reiterated his trust in Hamdallah and his cabinet. Abbas was satisfied with the performance of the interim government, and what it has achieved, al-Ahmad said. Hamdallah is committed to Abbas’s plans and has tried to implement them in its interim term, al-Ahmad added. 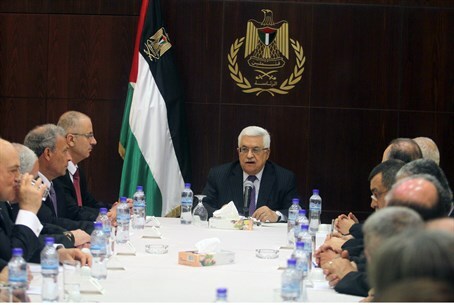 Abbas asked Hamdallah to form a new government on August 13, and gave him a time-frame of five weeks to do so. Hamdallah resigned on June 23 after just over two weeks on the job, and was appointed interim prime minister. He retracted his resignation on August 13 following a meeting with Abbas. Hamdallah was appointed as PM by Abbas following the resignation of his predecessor Salam Fayyad. Fayyad's resignation came as the result of internal PA pressures. He was long considered a favorite of the American government, and was accused by other PA officials of being too close to the U.S. administration.